On December 5, 1966 the current Powderhorn Ski Area was officially opened and dedicated. Fifteen hundred people attended the ceremony as Colorado Governor John A. Love cut the ribbon with virtually no snow on the ground. 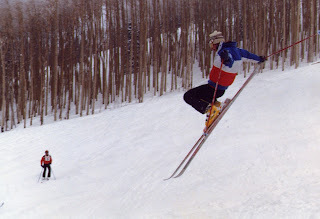 The Colorado Grand Mesa Ski Corporation built and operated the area in cooperation with Grand Mesa Winter Sports, Inc. They developed six miles of ski trails along with a double chair and a surface lift. As the area grew, another chairlift was installed on the west side of Powderhorn in 1973 taking skiers to the 9,800 foot level. Twenty years after its opening, Powderhorn was sold to a Texas cable TV mogul/developer. The double chair was replaced with a fixed grip quad and the surface lift was replaced with a double chair. Powderhorn Ski Area officially became “Powderhorn Resort.” The Day Lodge was expanded and snow making was introduced. In late 1998 the current owners, High West Group, LLC, purchased Powderhorn. A series of improvements began almost immediately. The west side of the parking lots were paved, 5000 square feet was added to the Day Lodge as well as a 5000 square foot sundeck and bridge. The hotel & restaurant were renovated and renamed “Inn at Wildewood” and “Wildewood Restaurant,” and significant infrastructure improvements were completed. Please do some more research on the ski area. Your history is as weak as a poor snowfall. Talk about Bill Foster, Larry klub, Harrold Harvey IDI and others that made it happen in the early years.